Sweet Salvage is thrilled to welcome Brooke Giannetti for our French Market event on Thursday, October 20th from 10:00am-8:00pm. 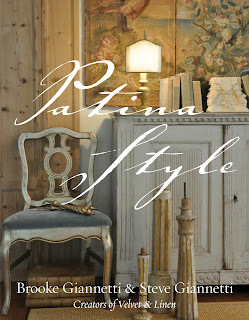 Brooke will be signing her beautiful newly released book Patina Style from 9:30am-3:00pm. Brooke and Steve Giannetti are known for creating warm, inviting spaces focused on real living. The husband and wife design duo behind the popular Los Angeles home store Giannetti Home, Steve is a renowned architect and Brooke is the voice of the well known blog Velvet & Linen (one of the Washington Post’s Top Ten design blogs). They bring their experience and history to their work in unique ways – Brooke loves laid-back antiques and subtle, sophisticated color palettes while Steve’s passions are in classical architecture and industrial-era pieces. By marrying their styles, they’ve created a fresh take on design that celebrates the life, history and patina in the things you surround yourself with. Their work has been featured in numerous national magazines, newspapers and books, including Veranda, Coastal Living and the New York Times. Sweet Salvage is located in the Melrose District at 4809 N. 7th Avenue, Phoenix, Arizona 85013. The Sweet Gang is busy as bees shopping and bringing in the most fabulous finds for the up coming French Market October 20th thru the 22nd. I feel as though they are taking me through France stopping in Paris then onto Provence. Feed sacks, old wine bottles, beautiful chandeliers, amazing wrought iron pieces that make my heart skip a beat and aged European furniture that only time can wear with such perfection. It is France done ever so "Sweetly" I am bursting with excitement. 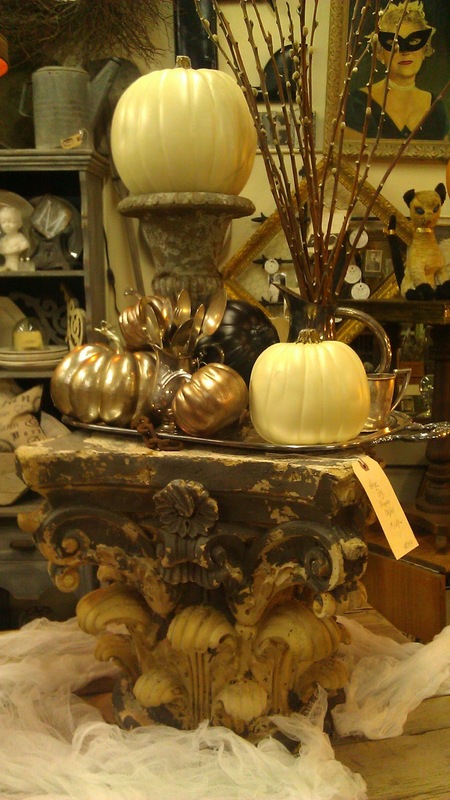 I have my my eye on a exquisite set of iron urns that would look so chic by my front door. Tell me friend what treasures are you hoping to find? What a Spooktacular weekend. It was wonderful to see all of you again and meet so many new friends. The Sweet Gang had a fantastic time presenting "Harvest Moon" to you. The deconstruction has begun in preparation for the "French Market" October 20th-23rd. Enjoy the pictures from this weekend and thank you all for being part of a very Sweet dream. 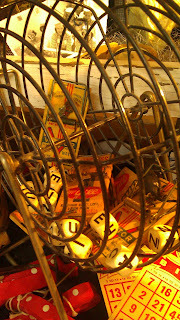 BINGO it's time! The Sweet Gang is so proud to present tomorrow "Harvest Moon". Everyone is bursting with excitement. Sweet is full of fabulous vintage designs to inspire you for Fall. Old farm cupboards and tables dance with Ironstone, french market baskets and the bounty of Harvest. Unique industrial pieces filled with amazing oddities and hard to find "Wow" are mixed with your favorite collectibles. Whether you love the simple beauty of Fall or the imaginative fun of Halloween you will be dazzled. 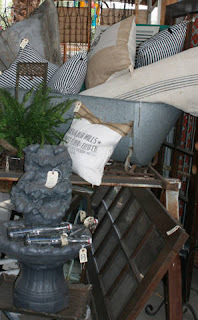 Sweet Salvage opens tomorrow morning at 10am and will be opened until 8pm. Friday through Sunday the doors open from 10am to 6pm. See you then. Five little Pumpkins sitting at Sweet. The first one said, "This place is a treat." The second one said, "Harvest Moon is in the air." The third one said, "Look at all this vintage Flair." The fifth one said, "I'm ready for some fun!" And the five little pumpkins are sure to delight! We are so looking forward to sharing Harvest Moon with you September 15th thru the 18th. Sweet Salvage is incredibly festive. It is sure to inspire you for fall. Only 6 more days. The Sweet girls have been busy spending the past few weeks traveling from here to there finding you the most "Spooktacular" treasures. 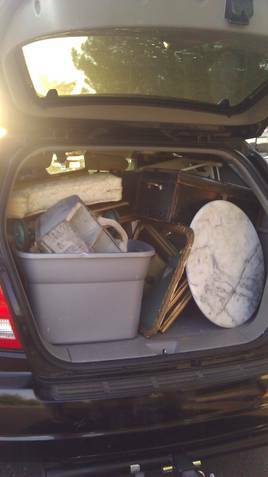 Let's play a little "I Spy" game. What great Fall inspiration do you Spy hiding? The first 3 correct guesses will win a Sweet little gift. Get those spectacles out and imaginations going. Ghoul Luck.